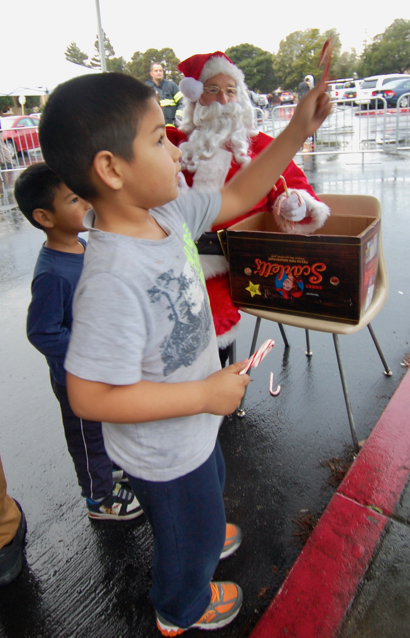 The rain cooperated this morning turning into light drizzle as hundreds of kids lined up for a toy giveaway at St. Anthony’s Padua Dining Room, an event co-sponsored with the Menlo Park Firefighters Association. St. Anthony’s works closely with the Menlo Park and San Mateo Fire Departments to collect the toys through their “Toys and Food” barrels around the community. All children ages 14 and under speak with Santa and then visit the room filled with toys to pick one large toy and a couple of smaller items. On Christmas Eve tomorrow, St. Anthony’s will be serving a traditional turkey dinner with all the trimmings noon to 2:30 pm. They expect to serve nearly a thousand individuals and families in need. Children who come for Christmas dinner will also get a toy. Tucked into the border of Atherton, Menlo Park, and Redwood City, St. Anthony’s Padua Dining Room is an often-overlooked kitchen compared to larger operations in the city of San Francisco, but it is the largest soup kitchen on the Peninsula mainly serving southern San Mateo and northern Santa Clara counties.